Take the train to Monistrol de Montserrat and ride the rack railway or cable car to the top of the holy mountain. These are all included with your Trans Montserrat card which is much more than a travel pass! Montserrat is a Benedictine monastery, a natural park and a shrine to spirituality and Catalan culture. 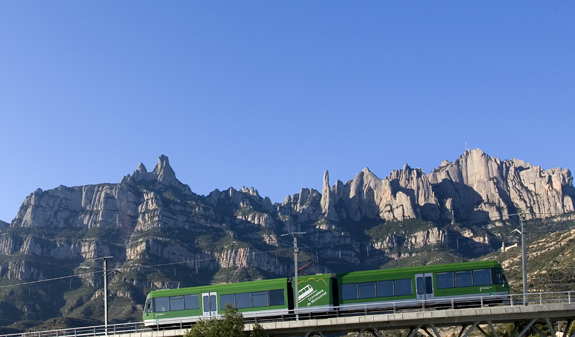 Discover it in the most relaxed way at your own pace with the TransMontserrat card. 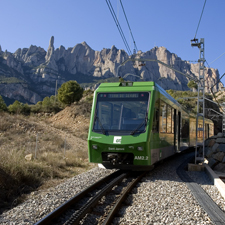 The train that will take you to Monistrol de Montserrat, at the foot of the mountain, leaves from plaça Espanya which is served by the metro network. Once you reach the foothills of Montserrat you decide if you want to get to the top on the rack railway, the Cremallera, which opened in the 19th century and has recently been refurbished, or by the cable car, the Aeri, which scales gradients of up to 45%. In both cases, you'll enjoy a journey with spectacular panoramic views until you get to Montserrat. When you arrive at Montserrat, you'll be able to visit the audiovisual exhibit "Montserrat behind closed doors". It takes you on a virtual tour of the monastery where you'll find out about the everyday life of a community of the Benedictine Order. Inside the basilica you'll find the Black Madonna, or "Moreneta", affectionately named because of the dark colour of her skin. You'll be able to extend your trip with a ride on the Sant Joan funicular, to see how far the horizon stretches from the Pyrenees to the sea. Round trip metro ticket from plaça Espanya. 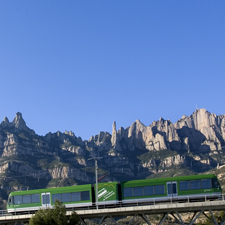 Round trip train ticket from Barcelona to Monistrol de Montserrat. Round trip ticket on the Cremallera or Aeri to Montserrat. Unlimited use of the Sant Joan funicular. Entrance to the audiovisual exhibit "Montserrat behind closed doors". Tourist information point in plaça Catalunya, daily from 8.30am to 8.30pm. (Except 1st January and 25th December). Tourist information point in Barcelona Airport. Terminals T1, T2 and metro L9 lobby; daily from 8.30am to 8.30pm. Santa Cova Funicular will remain closed until further notice. You must exchange the printed voucher at the specified collection point in order to receive the Trans Montserrat card. You will not be permitted to use the services listed without the Trans Montserrat card. No refunds will be issued if you have exchanged the voucher for the Trans Montserrat card. The station, funicular and "cremallera" are accessible to the disabled people. Visitors to the Montserrat Monastery are not permitted to wear braces, shorts or sandals.